I was in Mannheim on June 6 to give a talk entitled: “Europe’s Crisis of Legitimacy: Governing by Rules and Ruling by Numbers in the Eurozone” at the Mannheim Centre for European Social Research (MZES), in their political science seminar series. I argue that the Eurozone’s economic crisis has generated a crisis of democratic legitimacy, as deteriorating economics and increasingly volatile politics have combined with restrictive governance processes focused on ‘governing by the rules and ruling by the numbers’. 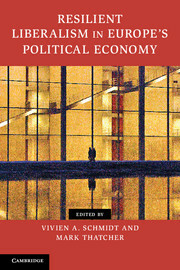 I analyze this legitimacy crisis in terms of problems with the ‘output’ policies, ‘input’ politics, and ‘throughput’ processes, arguing that in response to such problems, EU institutional actors—ECB, Council, Commission, and EP—all sought to reinterpret the rules and recalibrate the numbers ‘by stealth,’ that is without admitting it in their public discourse. My talk addressed not only issues of democratic theory but also neo-institutionalist theory, by analyzing on-going processes of ideational innovation and discursive legitimation during the Eurozone crisis using discursive institutionalism.